Months ago I wrote a serie of articles (Italian only) about why relying on an AntiVirus only is far from being an effective approach to network safety nowadays. Today, I stumbled upon this piece, where Brian Dye, Symantec’s senior Vice President for Information Security apparently says «AntiVirus is dead». To quote Mark Twain, I think the report of AV death is an exaggeration: nobody should -in my opinion- turn their AV off because it’s not effective anymore. It is certainly true, however, that this approach cannot be the only one in place if you plan to combat malware on your network effectively. In the fourth part of the series above I already suggested using lists of Command & Control IPs to create nullrouting or firewall entries to inhibit network traffic trying to reach “bad resources”. I also said how one of these lists is available from Spamhaus (as that’s the one I’ve been using) and how they provide this list in the form of a BGP feed you can configure directly in your border router(s). Whatever the list you chose and however you’re feeding it to your router, you’re going to face a problem: how to monitor what is being nullrouted and what the supposedly infected system is trying to do? Here is what I did and how you can use a normal linux system to dump and log the blocked traffic and hijack the HTTP sessions (that are by far the most interesting ones) to obtain more intel about the infections. Understanding where our linux system needs to be placed is important and may be less trivial than you’d think. What is labeled as “LAN” is actually much more than a single VLAN with lots of machines: it has its internal routing structure, but this is not important here. The border routers lie on the same (internal) network segment as the system we’re using as nullroute target. This means we don’t need to care about the route between the router receiving the nullrouted traffic and the nullroute target. If this were not the case, we’d need to ensure that the path followed by this traffic only traversed BGP-aware routers. 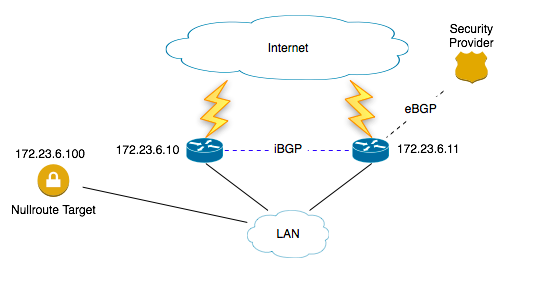 The IPs to nullroute come in through an eBGP session. This means we can manage the destinations to be blocked as “normal routes“, something we can’t do with ACLs. The iBGP session between the routers redistributes the nullrouted entries to every border router, with no need to replicate the ruleset to every border router in the network. Now our bad traffic is going to be delivered to the NIC of our NRT. What is this machine going to receive? The traffic is being delivered here due to a “next-hop” clause, like it was a router. Assuming our NRT is a freshly installed linux machine, what is going to happen, then? The packets are going to be accepted by the Ethernet stack and passed to the IP stack. Since their IP destination is not our NRT machine, each packet is going to be rejected with an ICMP Destination Unreachable, ’cause the system is not a router. That’s something, but we’d really prefer to simply drop most of the traffic while hijacking a portion of it instead, after logging it as extensively as we can. As you can see, we’re logging packets in the PREROUTING chain, before any decision about the whether the destination IP is local or not has been taken. We’ll see the reason for this later. As said, the reason for all this mess is logging what is going to be dropped as extensively as possible. That’s why we created the ULOG rule in iptables’ ruleset above. This second format is particularly interesting, as you can use tools like tcpdump or wireshark to inspect the content of the packets being dropped. This can be extremely useful when the dropped traffic is UDP, like DNS traffic. Of all the traffic we’re dropping, there’s one type that is particularly interesting: HTTP traffic. Given what we’re blocking (mostly Command&Control servers, used to instruct bots in a botnet) most if not all of the HTTP traffic we’re blocking will be caused by bots on our network trying to register and/or obtain orders from the botnet controllers. This kind of traffic will reveal which IPs on our network are infected and (by looking at the “botnet family” of the C&C) by what. However, since we’re dropping traffic between the bot and the C&C, all we have in our logs is a bunch of SYN packets; while they can be enough to start investigating the health status of the originating system, having better info about what the supposedly compromised machine is trying to do would be extremely helpful. We can do that, of course: we can hijack the HTTP traffic using a NAT rule, thus redirecting the traffic to a local HTTP server. This server will send every request to a script, that will capture the relevant informations and log them, while providing an innocuous page back to the client. We’ll then install our preferred HTTP server (I’ll use apache here) on the system, and configure it to bind to this IP only. As you can see, the DNAT takes place after the original packet has been logged. The trick, here, is applying the DNAT to packets going to any destination except our local NRT IP address: these are all packets trying to use the NTR as a router, but this machine does not announce itself as a router, and the only traffic of this kind reaching it is the traffic we’re explicitly sending to it as a result of our BGP next-hop definition. So, we don’t need to instruct the NRT with every single nullrouted IP and apply the DNAT to those destinations only. $command = “sudo /usr/local/sbin/getnatIP “.$_SERVER[‘REMOTE_ADDR’].” “. ” -> “.$output.”:”.$_SERVER[‘SERVER_PORT’].” \””.$_SERVER[‘REQUEST_METHOD’].” “. ($_SERVER[‘SERVER_NAME’] === ‘default’ ? ‘-‘ : $_SERVER[‘SERVER_NAME’]).” “. As you can easily guess from the above, I’m far from being a PHP coder (let alone a good one), but the above works well enough for now. We can safely assume, then, that the machine on that IP is compromised by this Trojan. You may have noticed how the PHP page calls an external script (through sudo) named /usr/local/sbin/getnatIP, passing the source IP and port of the current HTTP request as argument. This is done because the PHP script can’t see the original IP the HTTP client was trying to reach, since the destination IP has been rewritten by iptables. We can still recover that information, however, looking at the conntrack table used by netfilter/iptables (in /proc/net/ip_conntrack), except this resource is not accessible to apache but to administrators only. This script expects -as seen above- the current session IP and ports as arguments, then opens /proc/net/ip_conntrack, searches for the conntrack entry matching them and exits returning the original IP before the NAT. 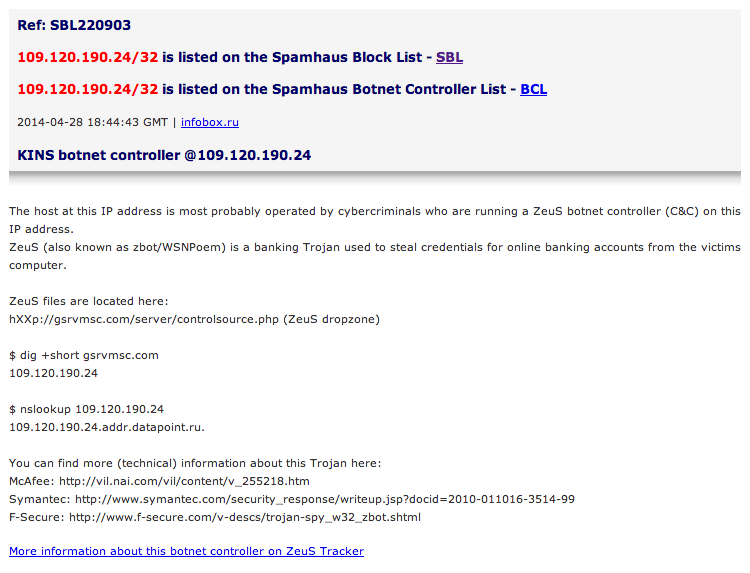 Feel free to look up the Spamhaus website to see what is what (if the related SBL pages are still up when you read this). I’ll probably need to switch to a language I’m more comfortable with (another name for “perl”) and perhaps ask SH people if they are providing the same informations in an easier-to-parse format (through an API, maybe?). Having the listing details stored with the record entry will result in a much more useful set of info available to the internal NOC when a botnet alert is triggered. Just a final note. If you are familiar with routing, you’ve certainly realised how the above doesn’t really require your network to run BGP. As a matter of fact, for most corporate networks doing the above using BGP is a problem: BGP is not always available or used and, when it’s used, it’s used on the border routers, outside the firewall and therefore “after source NAT has been applied”. If we run our NullRouting+Hijacking there we lose an extremely interesting information: the IP of the compromised client, unless we peek into the firewall’s translation tables or logs and correlate. On the other side, on many firewall platforms, running BGP is simply not supported, so running a BGP session there with the sole purpose of nullrouting this bad traffic is not an option. However, firewall appliances (at least serious ones) usually support an IGP of some kind (like OSFP). Your NRT will then divert all the traffic trying to reach C&C servers to itself, and hijack the HTTP portion of such traffic, with exactly the same results as above. Perhaps I’ll get on this another day and describe how to make it work.